Cheetahs are beautiful and speedy. They can run as fast as 110 kilometers an hour. There once were more than 100,000 cheetahs living in Africa and Asia. Today only about 10,000 of the animals remain. Most are in 24 African countries. 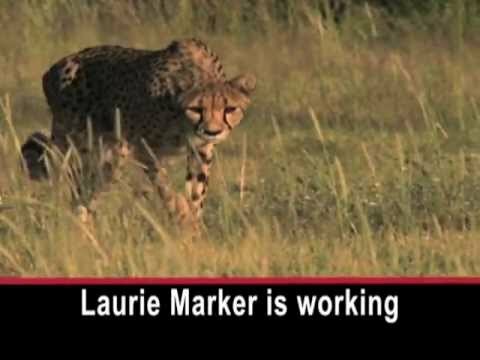 Laurie Marker is working to keep cheetahs from disappearing. LAURIE MARKER: "I started working with cheetahs when I lived in Oregon -- and I ran a wildlife park there; this was back in the early '70s, and nobody knew anything about cheetahs and I was fascinated about them, and the more people I asked they said 'when you find out something about cheetahs let us know; they don't do well in captivity, they have a very short life span, and we're losing them throughout the ranges in the world.' So that just made me fascinated and I wanted to know everything there was about them." Dr. Marker traveled to Namibia to learn more about cheetahs. The country has the world's largest wild cheetah population. LAURIE MARKER: "Understanding about how the cheetah lives is really important. So understanding its biology and its behavior, understanding the ecology of it, which really revolves around where it's living and, and how it's living, and that interfaces with humans." In 1990, Dr. Marker created the Cheetah Conservation Fund, a nonprofit group based in Namibia. Farmers often kill cheetahs because they can attack cattle and other farm animals. So Dr. Marker started working with farmers to find ways to help protect their animals from the big cats. In 1994, she began telling farmers about the Anatolian Shepherd. LAURIE MARKER: "This breed has been used for about 5,000 years to protect livestock from predators. And they act as a guardian by avoidance - they bark loudly, they tell the predator that they're there protecting the flock, and the flock will come around the dog and by the dog barking -- the predator doesn't want to get hurt - and they will then avoid those flocks where the dogs are." Over fifteen years, the Fund has donated more than 400 dogs to livestock farmers in Namibia. The farmers have reported up to an 80 percent decrease in farm animal deaths. LAURIE MARKER: "Since our time in Namibia the population of cheetahs there was about 1,000 to 1,500 individuals. Today it's probably 3,500, maybe 4,000 cheetahs. So we've been able to really grow the population. And that's out of a world population of about 10,000." Dr. Marker wants to expand the CCF programs to other countries, where cheetahs once lived. LAURIE MARKER: "If we are not successful we're going to lose this amazing species in a very short period of time."